Who Will Step in for Injured Rangers Center Derek Stepan? Who Will Step In for Stepan? The New York Rangers were already coming into the 2014-15 NHL season with a lack of center depth. Though ineffective in the playoffs, Brad Richards was a top-line mainstay in the regular season, finishing third on the club in scoring and leading the Rangers in shots on goal. Brian Boyle anchored the team’s penalty kill, taking half of the Rangers’ shorthanded draws and finished second on the team in faceoff percentage (52.9%). For the next four to six weeks, so is Derek Stepan. The Rangers’ projected top-line center may miss 12 games – or more – with a broken leg. The 27-year-old Quebec native will move up to the number one center role. He’s been there before, even if the results haven’t been spectacular. He spent a handful of years as the top pivot in Columbus, with Rick Nash playing on his wing. Brassard’s game has continued to develop and mature since then. He’s the only centerman the Rangers have who can even lay claim to this spot. 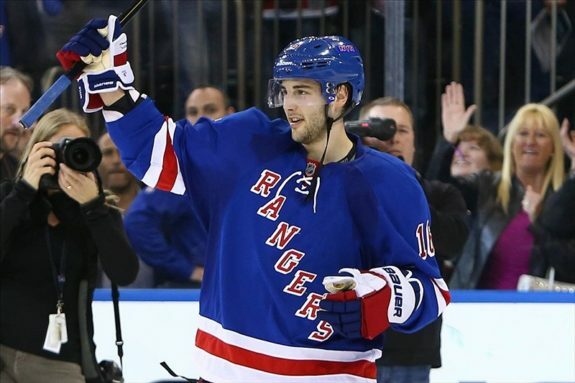 The Blueshirts inked Brassard to a 5-year, $25-million deal during the offseason. It’s time for him to start earning that paycheck. Brassard’s move pulls up the centers below him. Moore moved to the second line during the Rangers’ playoff series against Montreal to fill in for injuries to Brassard and Stepan. Moore’s unit played well together, so there’s no reason to think Vigneault would hesitate to give them another shot. Unless, of course, he decided to give one of the yonger players an audition between two offensively skilled wingers. Vigneault knows what he has in Moore. He’s solid, reliable, and can fill in wherever needed. The coach doesn’t have that awareness on some of the younger players, who’ve seen limited experience or whose opportunities have come with wingers less talented than Kreider and St. Louis. They’re also the ones with greater potential. Perhaps this is their shot. Pencil Moore in for the fourth line, with spot duty as needed to protect a late-game lead or other defensive responsibility. Miller is the leader in the clubhouse to man the second line. He’s come out of the gate looking strong so far in the preseason. After failing to get a jump start on training camp and being called out by his coach last season, Miller knows what’s expected from him. “I’ve got to be more rounded,” said Miller. “I think offense comes more natural. I need to be smart all over the ice.” So far, he has been. He showed up to camp in excellent shape and ready to play, and his preparations show on the ice. Miller’s off to a great start. This is his spot to lose. Brassard, Moore, and Miller are locks. Which remaining center will get a shot in the Rangers’ opening night lineup? The 22-year-old Swede finished second in scoring last season for the AHL Hartford Wolf Pack, picking up 22 goals and adding 26 assists. He led the Pack with 183 shots on goal. “He’ll be pushing guys at the center position very soon,” said Rangers director of Player Personnel Gordie Clark of Lindbergh. “He has a good work ethic and a good two-way game.” One can only imagine Clark didn’t envision him stepping in quite this soon. Lindberg told Hockey Sveridge that playing a full AHL season, including time on the power play and penalty kill, has prepared him to take that next step, and that now he knows what to expect at the NHL level. While he didn’t suit up for the postseason, Lindberg traveled and practiced with the team during the playoffs, giving him an introduction to life with the big club. Though another year in the AHL would serve him well, this early-season audition is an opportunity for him to make his case that he deserves to stay in New York. He’s the one most likely to get a shot as the third-line center. Lombardi led the Swiss League in scoring last year, posting 20 goals and 30 assists in 46 games with Geneve-Servette HC. The 32-year-old veteran also helped lead the club to its first Spengler Cup. Lombardi was brought to New York for bottom-six depth and as an ever-popular Glen Sather reclamation project (see also: Benoit Pouliot, Ryan Malone). Lombardi’s career hallmarks are his speed and his injury history. The fleet-footed forward has fallen victim to multiple concussions, with his last full NHL season back in 2007-08. Lombardi was brought in as a back-up plan. Should Lindberg or Miller struggle, he’ll likely be the one tapped as the replacement. Hayes, 22, spent the past two years on the wing at Boston College. 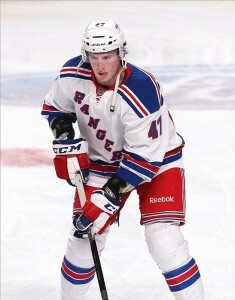 The 6-foot-5, 225-pounder moved to center for the Rangers’ prospect tournament in Traverse City. There’s no reason to rush him into an unfamiliar role at the NHL level. If he stays with the Rangers, he moves to wing. If they see him as a pivot, he’s better off starting the season in the AHL to refine his game at center ice. 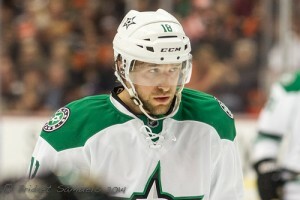 Mueller, 28, is a New York native who spent last season with the AHL’s Texas Stars. In 60 games, he posted 25 goals and 32 assists, including a team-high 15 power play markers. He’s had a few cups of coffee in the NHL, picking up 37 games with the Predators from 2010-2013 and nine games with the Stars last season. He’s not flashy, but he’s a solid fill-in. Early in the season, though, is probably the best time to give one of the younger guys a shot. Sean Hartnett of CBS Sports picked up on one thing Mueller has going for him – he’s a righty. Every other center on the Blueshirts’ roster is left-handed. There’s a spot open. Who’ll be the one to make the most of it?